Wound rotor motors are suitable for loads requiring high starting torque and where a lower starting current is required. The Wound rotor induction motors are also used for loads having high inertia, which results in higher energy losses. Used for the loads which require a gradual buildup of torque. Used for the loads that require speed control. The wound rotor induction motors are used in conveyors, cranes, pumps, elevators and compressors. The maximum torque is above 200 percent of the full load value while the full load slip may be as low as 3 percent. The efficiency is about 90 %. Many polyphase cage induction motors are available in the market to meet the demand of the several industrial applications and various starting and running condition requirement. They are classified according to the Class. The speed torque characteristics of Cage Induction Motor of various Classes are shown below. Class A motors have normal starting torque, high starting current and low operating slip (0.005-0.015). The design has low resistance single cage rotor. The efficiency of the motor is high at full load. Applications of Class A motors are fans, blowers, centrifugal pumps, etc. Class B motors have normal starting torque, low starting current and low starting current and low operating slip. The motor is designed, in such a way to withstand the high leakage reactance, as a result, the starting current is reduced. The starting torque is maintained by use of a double cage or deep bar rotor. The Class B motors are most commonly used motor and used for full voltage starting. The applications and the starting torque are same as that of Class A motors. The class C motors have high starting torque and low starting current. Such motors are of the double cage and deep bar and has higher rotor resistance. The loads are compressors, conveyors, reciprocating pumps, crushers, etc. 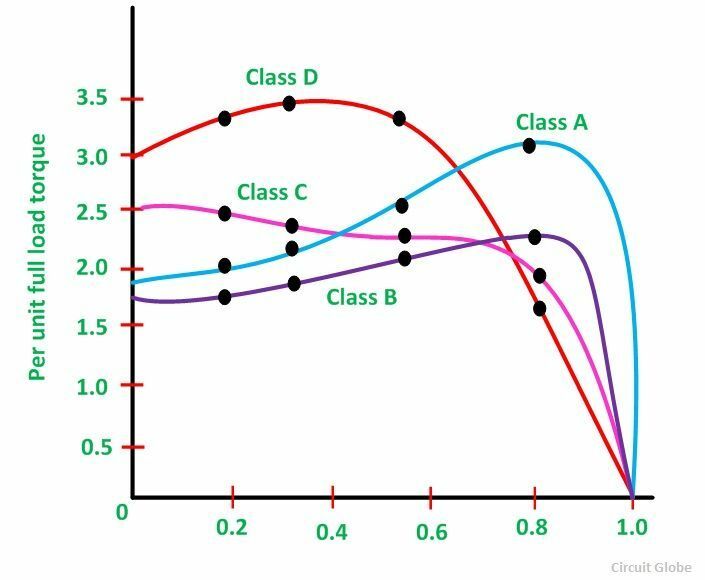 Class D motors have the highest starting torque as compared to all the other class of motors. The bars of the rotor cage are made up of brass. These types of motors have low starting current and high operating slip. The value of full load operating slip varies between 8 to 15%. Thus, the efficiency of the motor is low. These motors are suitable for driving intermittent loads which require frequent acceleration and high loads. For example – punch presses, bulldozers and die stamping machines. When the motor is driving the high impact loads, it is coupled to a flywheel to provide kinetic energy.